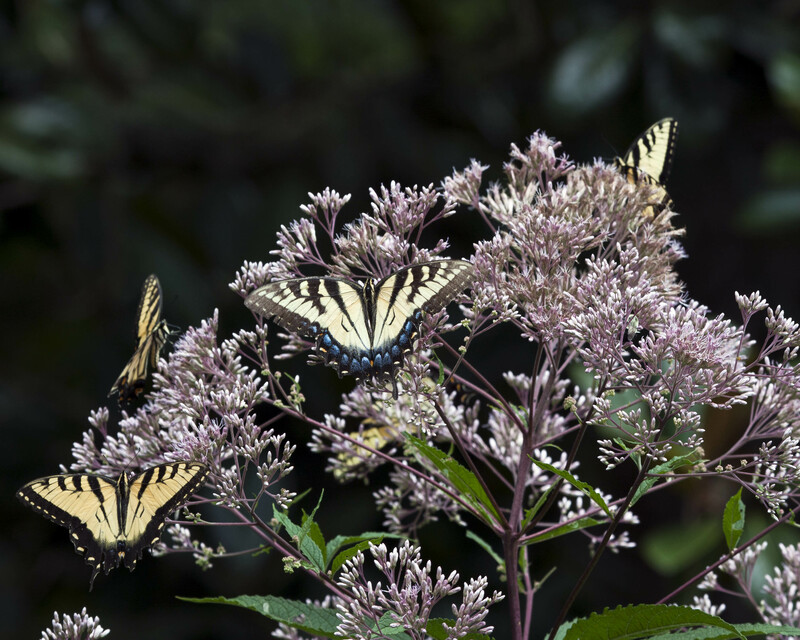 « Need help getting rid of invasive plants in your yard? Nativars — what are they and why should you care? The only gardening magazine I subscribe to is The American Gardener, the magazine of the American Horticultural Society. It’s a benefit of membership – the only one I use much – and membership is expensive, compared to the annual cost of other gardening magazine subscriptions. But only this magazine consistently provides articles in which I actually learn new and useful information. It is the only magazine that asks me to think about gardening in a larger context. A case in point is the March/April 2015 issue. Articles range, as usual, from practical concerns (“Designing an Inviting Garden”) to an article addressing the long-range health of our gardens and the native ecosystems in which they grow. “Coming to Terms with Nativars” by Graham Rice, a well-known garden writer, is an article I wish every gardener would read and take to heart, because it addresses how the choices we gardeners make – even when planting what we think are native species – can affect the well-being of the native wildlife we are trying to support with those planting choices. As Mr. Rice explains, the term nativar was coined by the well-known plantsman, Allan Armitage, to identify cultivated forms and hybrids of native species. Nativar is a combination of the words native and cultivar. Cultivar is another coined term made from two words – cultivated and variety – and indicates that the plant in question was either deliberately developed by horticulturalists or it was spotted by them in a garden somewhere and named and propagated. Double flowers – Many double-flowered nativars, such as these, do not produce much pollen or seeds, rendering them irrelevant to pollinators and seed eaters. Some doubles produce some pollen, but the changed shape of the flowers makes it nearly impossible for pollinators to reach it. Foliage color – The same pigments that give many purple-leaved nativars their leaf color also apparently make those leaves taste bad. Native insects that evolved to eat those species don’t eat the purple-leaved ones, thereby endangering the completion of their lifecycles. Remember that we need those insects to feed our native birds; always the interconnectedness of life must be considered. Size and flower color – If these traits diverge widely from the species, wildlife may not utilize such nativars. Bees, for example, are very sensitive to flower color. If a nativar color diverges widely from its parent species, it may not be recognized as a food source by these insects. How do we know which nativars are good for everyone? Rice consulted the experts, who suggested that gardeners interested in creating gardens inviting to native wildlife as well as humans should choose nativars that closely resemble the species, but perhaps bloom longer, such as Lonicera sempervirens ‘Major Wheeler.’ Nativars that look like the species but don’t grow as tall, such as some of the dwarf Joe Pye Weed offerings, also remain appealing to wildlife. Height doesn’t matter to the pollinators as long as the flowers of nativars resemble the species from which they are derived. The genetics of plants are affected by how they are propagated. Plants grown from locally collected wild seeds will be genetically different from those grown from seeds collected from stock plants in a nursery. These differences may not be apparent to us, but the wildlife that utilizes them for food may not respond in the same way to such plants. A native species with a wide range – say from Michigan to Texas – will vary genetically, especially at the opposite ends of its range. 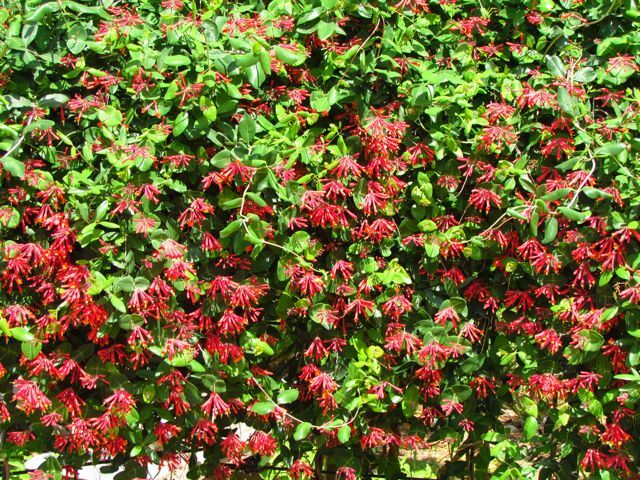 It makes sense that species selection would favor plants best adapted to the cold of Michigan winters, and that those plants would not fare as well in the heat of Texas summers. 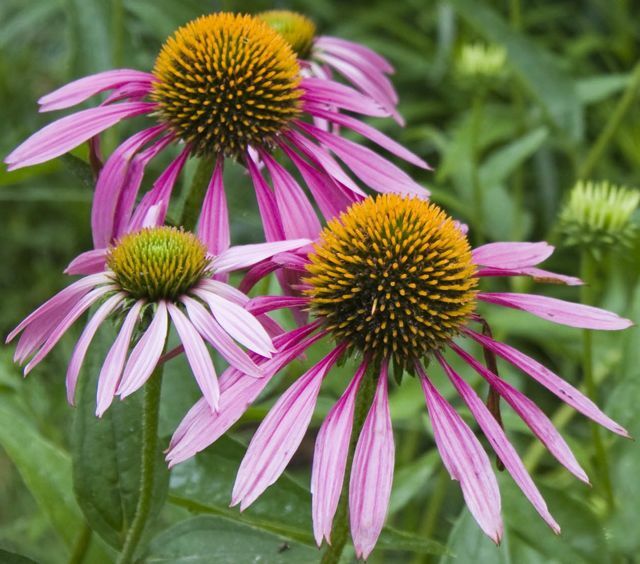 Purveyors of wildflower seeds that don’t identify where the seeds were collected (called provenance) are not helping gardeners choose the plants best adapted to their geographic regions. Rice says the experts are still trying to decide if nativars propagated from naturally occurring plants in the wild are better for native wildlife than nativars developed by horticulturalists in nurseries. 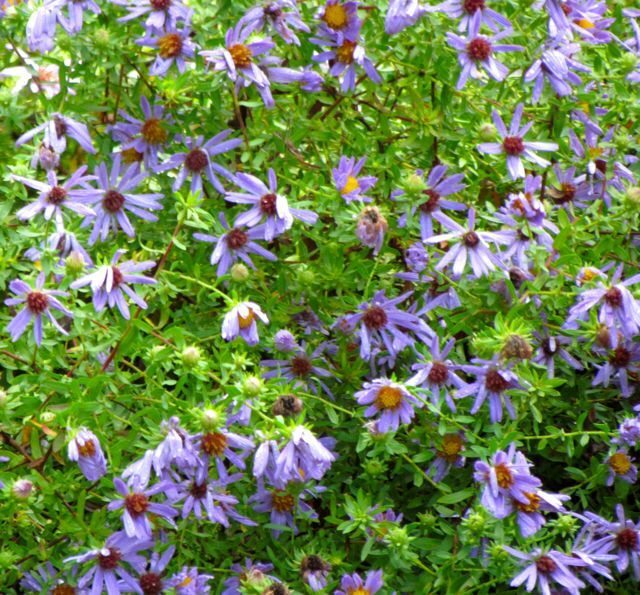 For example is the nativar of aromatic aster, Symphotrichum oblongifolium ‘October Skies’ better because it was developed from a plant found growing wild? The jury is still out. My October Skies asters buzz with pollinators from dawn to dusk every late summer/fall. Mr. Rice’s article doesn’t much change what I’ve been doing in my yard. I do buy nativars, but I’ve always been drawn to the ones that don’t look that different from the species. Now I have good reasons to continue selecting nativars that closely resemble their parent species. Given the exponential decrease of worldwide wilderness that I wrote about here, I think any gardener who cares about the health of our dwindling native ecosystems should pass on fancy double flowers in unusual colors and favor the many gorgeous, vigorous nativars that will not only beautify a yard, but also benefit struggling native wildlife. Seems like a no-brainer to this gardener. When the species is as gorgeous as this Cardinal Flower, I feel no need to grow its nativars. My thanks to Graham Rice and The American Gardener for spelling out these issues so clearly for us. This entry was posted on May 19, 2015, 4:30 pm and is filed under Native Wildlife, piedmont gardening. You can follow any responses to this entry through RSS 2.0. You can skip to the end and leave a response. Pinging is currently not allowed.